“We had a great day on the river today. Karen and I have entered JIYUU in the Doublehanded Long Race Series and today was the first race. Finally, we had a lovely sunny day with a light sea breeze that started at 5 knots and gradually built to about 12 knots- perfect for a short-handed J/88! The race was a windward and return down the Derwent, finishing through the famous Sydney-Hobart finish line with our new A2 spinnaker on display. We ended up 2nd across the line boat-for-boat! In fact, we were only 11 seconds behind the Marten 49 "Tilt" after 3 hours of racing! Incredible! As a result, we finished 1st on AMS, and 5th on PHS (the smaller boats ran up behind us with the freshening sea breeze). This picture was taken by one of Matthew's friends who was the crew on Tilt as we crossed gybes just before the finish line! Needless to say, they were amazed at our overall performance! 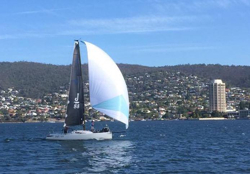 Cheers, Peter” For more J/88 family speedster sailing information Add to Flipboard Magazine. J/Crews Sweep Double Farallones Classes! Smashing San Diego NOOD Regatta! J/70 Stadium Sailing Hits Detroit Race Track! The Perfect Junior Offshore Big Boat Trainer?? Silvestri Dominates J/22 Cal Dreamin Match! Big Daddy Regatta Silver For J/Teams! Lowell North Celebrating 60 Years of Sailmaking! “New” Double Farallones Race Innovations! Kate Wilson: Making Sailing Better! Sailing a J/88 to Havana, Cuba!? ARBITRAGE Trumps Spring One-Design Regatta! Mardis Gras Race Week Blowout! J/Teams Dominate Heineken St Maarten! Russians Win Monaco J/70 Winter Series! J/24 TARHEEL Hyuuge Silverware Haul @ Mids!